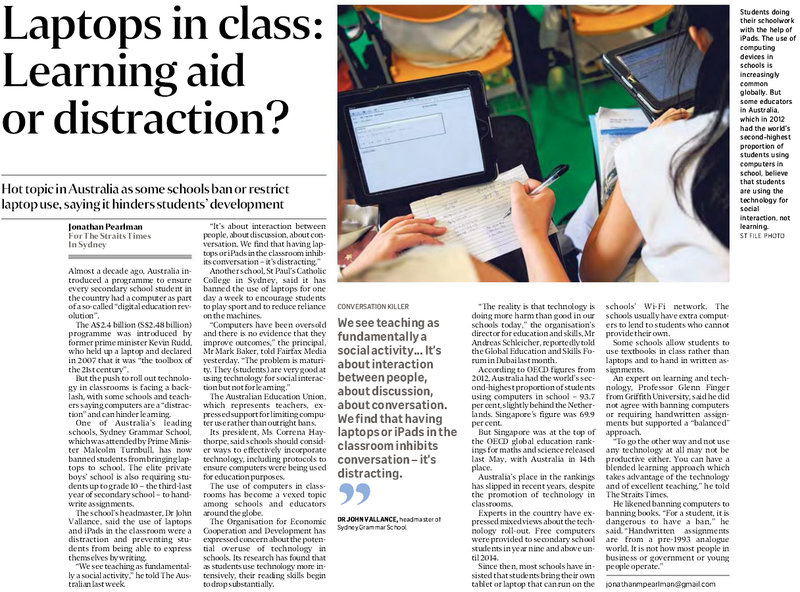 “But the push to roll out technology in classrooms is facing a backlash, with some schools and teachers saying computers are a “distraction” and can hinder learning” (Laptops In Class: Learning Aid Or Distraction?, Jonathan Pearlman). Especially since few will dispute the importance of developing familiarity and perhaps even mastery of technology, it seems even more apparent that the problem lies not with technology, but how we use it. It is convenient to blame technology in classrooms – the use of laptops and iPads, for instance – as a “distraction” which hinders learning (ST, Apr. 2), when the management of technology should be the focus. In other words instead of blaming technology per se for hindering student development, it would be more useful to concurrently evaluate and improve pedagogies within school environments. Because while it may be true that teaching is “about interactions between people, about discussion, about conversations”, technology could in fact facilitate interactions across these three dimensions, and it should fall on schools and their educators to craft reasonable modes of engagement. Furthermore, the convenient conclusion by the Organisation for Economic Cooperation and Development, that “the reality is that technology is doing more harm than good in our society”, can be – and should be – problematised. My personal experiences with technology in education have been mixed, yet the more effective iterations were often premised upon good planning by the administrators and the educators. As part of a small writing and critical thinking class in the university a few years ago, we were each loaned an iPad unit, through which we were expected to do our readings, annotate and makes notes, as well as to prepare presentations. Familiarising oneself with the technicalities or negotiating through new applications might have been challenging in the beginning, but administratively the classroom was wired seamlessly, such that screens from any of our iPads could be projected during classroom discussions. Our professor facilitated these transitions effectively – thereby enriching the lessons – and he also highlighted how we could leverage upon technology for research: aggregating key terms, collaborating on projects, and conducting efficient literature review, for example. Professor Glenn Finger of Griffith University was right about a “balanced approach”. “To go the other way and not use any technology at all may not be productive either, he said in his reply to ST. “You can have a blended learning approach which takes advantage of the technology and of excellent teaching”. Especially since few will dispute the importance of developing familiarity and perhaps even mastery of technology, it seems even more apparent that the problem lies not with technology, but how we use it.